This week I thought it would be fun to have a little series called 'Vintage Underpinnings', because what goes on underneath the clothes is often as important as the clothes themselves for creating a vintage look! 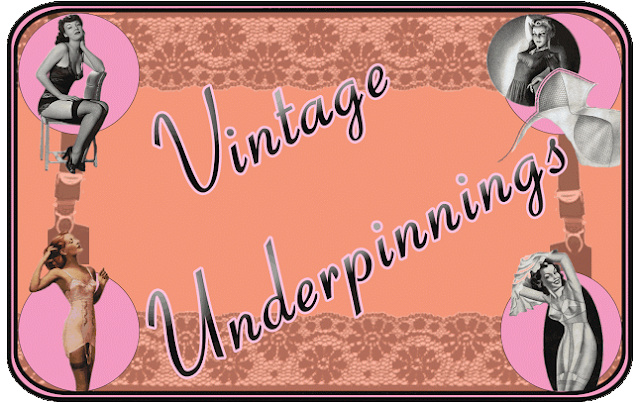 I'm looking forward to exploring some different types of vintage underpinning garments and will try to link to sewing patterns and places to source different pieces. I'm also looking forward to hearing about some of your favourite vintage-inspired foundational garments! The high-waisted bit is a 'tummy control' panel that comes up quite high (just under the bra for me). It's not too tight at all around the stomach--so I'm not sure how much 'tummy control' there actually is…Though, I did find it a bit difficult in the beginning getting them over my *ahem* thighs and bum. lol. But once on, I found the thermals to be quite comfortable and I liked having the extra support! Whoever thought of these--is brilliant! Thank you--now I can wear thermals with my high-waisted trousers, which is good since the green and tweed pairs of trousers I made are of lightweight wool. Definitely not warm enough to keep out the Scottish wind without some sort of thermals underneath. On a side note, isn't this sweater set cute? I got it a local vintage fair and I've been wearing it a lot because the white embroidered paisley designs remind me of winter snowflakes!! Thanks to the Marks and Spencer team for letting me try these out! Have you seen any other high-waisted thermals? 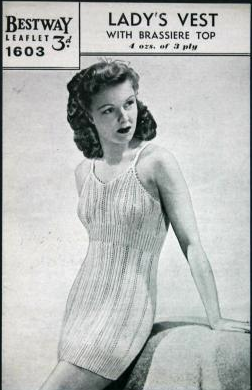 What about vintage-inspired thermals? I LOVE those trousers and can completely see why you have made so many. They look fab in all those colours and the high waist cut so nicely. It's a good seven months until we hit trouser season again here, but I'm heading straight over to ebay after this to see what I can find along the lines of simplicity 3688 ;-). I will let you know if those trousers end up popping up on my blog down the track. Oh, I'm going to have to get a pair of these! I remember my dad talking about how cold it was in Glasgow when he was in medical school there in the 30s and early 1940s. He wore a heavy wool tweed suit all...the...time, with wool knit underwear. Now, part of it was the face that things were heated with coal fireplaces at the time but it was damp and cold and he felt it!! What a splendidly fun post series! 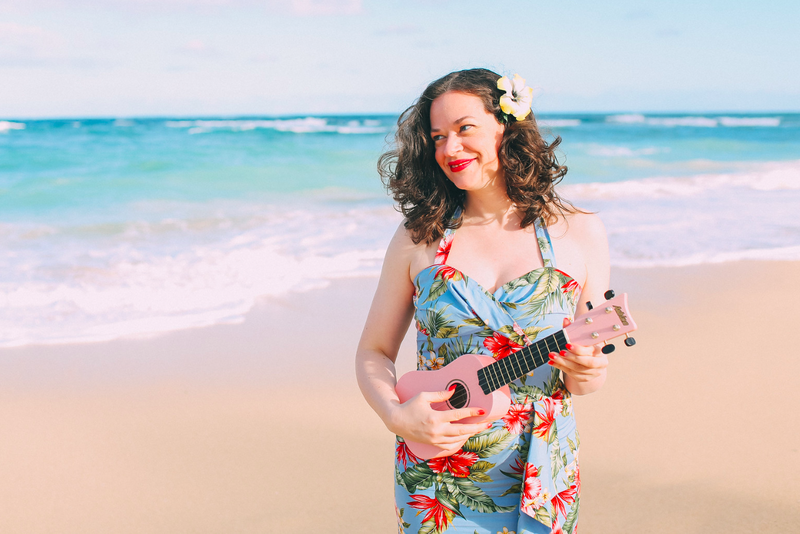 As someone who hails from a mighty nippy climate, too, I'm all for undergarments that help keep you roasty-toasty (or at least from getting frostbite) during the fall and winter, too. Can't wait to read the next instalment in this series. *PS* That peach and white paisley cardigan is flat out gorgeous! I haven't come across any (either patterns or ads for RTW) in my vintage magazines. Of course, the Netherlands don't get quite as cold as Scotland so that might explain the difference. By the way, I spent a semester in Edinburgh years ago (from January till Easter) and I remember how high the room temperatures were just about everywhere. I dealt with that by wearing thin winter clothes in layers and a warm coat but I noticed that many locals would go outside without coats. And now you're talking thermals… I completely understand that if you have to spend a lot of time outside in winter but how do you deal with those in Edinburgh's room temperatures? Underwear is fascinating... but I have to tell you the thermal vest you show can still be bought at any department store in New Zealand (well the southern half of the country anyway). It's called a singlet here and I have 2 or 3 identical to this one that I wear in winter, especially in bed. (It's a wee bit grandma - cooler kids layer coloured merino tops). Nowadays they're made either of wool, usually merino, or sometimes of polypropylene or similar. I also have some natural coloured woollen thermal leggings I bought in Turkey in the 1990s, thinking I'd need them in the British winter but unaware of the ubiquity of central heating. Love your high waisted thermals. There's nothing like thermals under woollen trousers for real warmth. Nylons add a bit of warmth but I doubt 40s women were wearing precious stockings under their trousers! Those do look great! I don't really wear trousers, but I've been thinking about making some, looks like I need to add the pattern and the thermals to my shopping list. 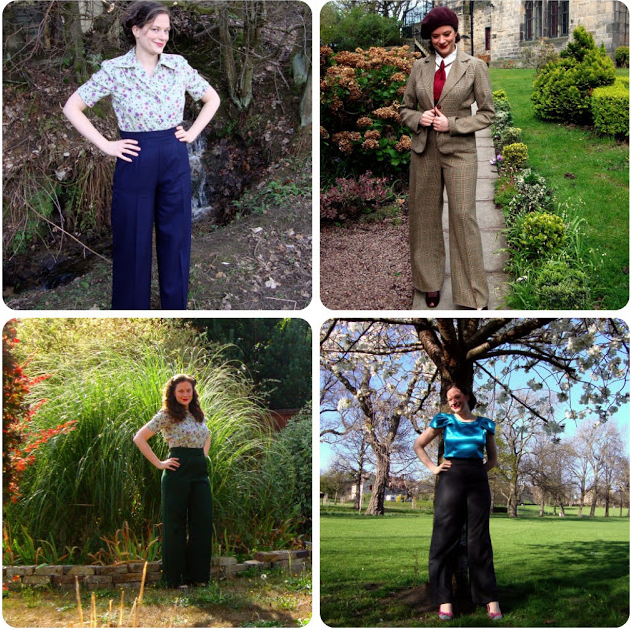 I've just made the Simplicity 3688 trousers, I love then, I used a light weight fabric though so I might need some of these thermals before long, thanks for the tip! LOVE your cardigan! The beading, particularly the scalloped edging is gorgeous! What a great find! Thank you so much for this!! I will have to search out some singlets…they sound nice and toasty!! I'm fascinated by 20s undergarments (and the 20s in general)!! We still use (smokeless) coal in the fireplaces!! Not as nice as wood-burning fires in my opinion!! Did your Dad ever show you any photos from Glasgow in that time period? I bet that was such an interesting time period to be there!! Oh wow…what a great present! And perfect for the winter months! No, actually, he did not have a camera at the time that I know of but I do have a couple of photos taken of him from that period. Interesting? Well, it was during WWII and they were being bombed a lot. As I recall, one of his stories was of leaving his rooming house to go to classes, only to find the street all blocked off with police and firemen because one of those German bombs (big round things with spikes) that was put out of planes with parachutes) had caught on the corner of one of the buildings on his street and was hanging by a rapidly tearing parachute. I'm on my second pair of knit silk long underwear--they're fantastic! No bulk, slippery without static, breathable, and they work well under jeans or trousers. Excellent way to stay warm on a windy winter day, or while waiting for the bus. The entire time I was reading this post I kept thinking about how much I love that sweater! I need to get a pair of long underwear like those. They don't look bulky at all. It must have been sobering to be studying medicine during the war. That story about the bomb is scary but I imagine it happened all the time. Elizabeth Zimmerman's Knitting Almanac contains instructions for knitting your own "nether garments," specifically footed tights. For true authenticity, you could knit up your own pair of woolen leggings, in any color you like. (You may enjoy looking out anything written by that estimable woman -- even if you don't care about knitting, she was an engaging author who lived an amazing life in England, Finland, Germany, and the United States. I was studying at Edinburgh College of Arts back then and it was pretty warm there. And I stayed in new student accommodation which I shared with others, who liked to keep the place quite warm. So, I don't really have personal experience with staying in any of the old buildings. I loved Edinburgh. I keep wanting to go back for a visit but somehow I didn't get around to doing so yet. Shop my vintage pattern stash! !